Pruning - Prune means to remove something. Pruning - Correct, or Professional Pruning of a tree, is a two-part treatment that demands a specialized knowledge of collars and dose. Knowing how to remove a branch without injuring the tree requires an understanding of branch anatomy and defense boundaries, whereas knowing how many leaf-bearing branches can be removed without injuring the tree requires an understanding of the symplast and the second law of energy flow. (A PROFESSIONAL UNDERSTANDS DOSE, SHIGO, 1996) Correct pruning cuts reduce the chances of at least 18 serious tree problems from happening. Pruning is a four part process; how to cut, which to cut, when to cut, and how much to cut. Not easy. 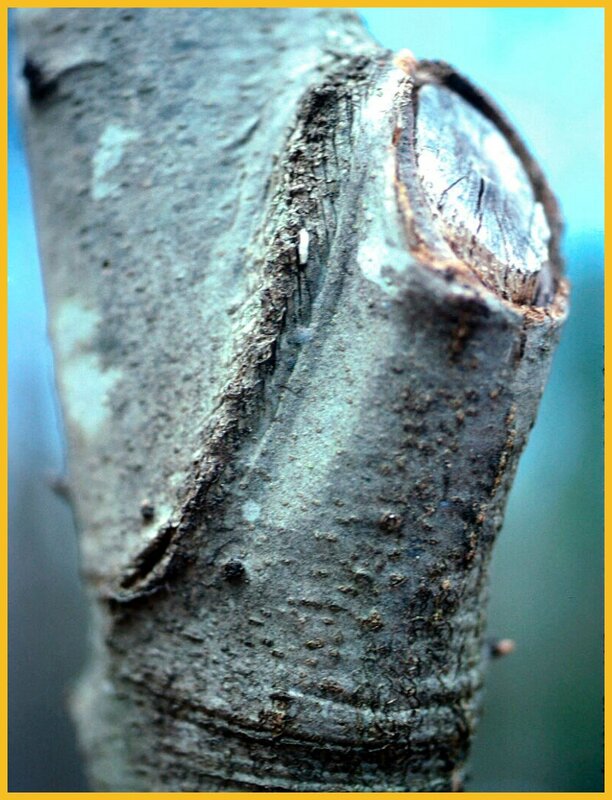 When flush pruning was considered correct, timing of pruning was extremely important because the cuts caused serious trunk injuries that removed the branch protection zone. When collar cuts are made, timing is not so important. Small mistakes that injure the collar or trunk during leaf flushing and leaf shedding can still cause injuries. Some of the worst pruning in the world has been present in fruit tree orchards. I have learned the following: Would you buy and use a product that gave you perfect teeth, but rotted your gums? We must care for the soils. We must treat the system, not just one part. Composted wood and leaves are tree system food, not a bag of so called fertilizer. To prune a forest, to make a decision on dose timing and targets, one would need to first have an understanding Tree Biology with respect to the Ecological Stages of Trees and their functionality, above as well as below, ground, i.e., if the target was to do no harm. Use more ecoart-nurse logs in landscapes. When a tree is wounded, you should not treat only the wound but the entire tree. In other words. Pruning is removal of parts from a system in ways, timing, and amounts that will be beneficial to the system and others nearby. Correct pruning of roots can benefit healthy establishment. Pruning branches from trees can lead to greater safety for the tree, property and people near the tree. Correct pruning can increase the beauty, and flower and fruit production. There are many other benefits. In other words. Pruning, or shall we say tree pruning? Because in a general sense pruning is the removal of parts from any system in ways, timing, and amounts that will be beneficial to the system and to others nearby. Now when we speak about tree pruning, we not only talk about pruning branches, we also should talk and think about pruning roots. Especially in the nursery. We know of nurseries that prune many times (at least 5 and 6 times they prune the roots). Yet, they can do that, because they don’t have the rocks in the soil as we do in Northeastern USA. Pruning can benefit the tree by preventing the tree from splitting, falling, and this in a sense will give the tree a higher quality life for a longer time. There are some people who question the benefits of pruning. You can hear and read in some forestry literature that a tree self prunes. They do not self prune. The branches shed. But they don’t go out with a saw or knife and prune. The biggest part about pruning is that it has been a very controversial subject for years. There are thousands of books on how to take branches off a tree. There is only one paper we know of that tells you how they come on trees. And we believe once you know how something comes on, you will be able to take it off. They still have many books but they seem to forget where the information came from. Dr. Shigo’s first paper on this subject was rejected in the most ridiculous way possible by some big organization. They quickly followed it by several papers saying how bad, how nasty, how wrong he was. We think they are now pruning the correct way. Think about it all. It’s so ridiculous sometimes we have to be careful not to get carried away. Just think about it. Bless the people who thought it was wrong. They must have some difficulties. A MUST! See "TREE PRUNING - SHIGO." Click here for "FLUSH CUTS"!!! Click here for a new, large section on pruning!!!! Click here for more on "pruning". NOTE: Root pruning is different than that of stem pruning. Click here for more on root pruning. Click here for stem pruning pictures.